More often than not, a monumental moment in time isn’t marked with bells, whistles or a hallelujah chorus. When a destined life path is discovered, sometimes it’s something more subtle or simple like, say, crayons. After painting throughout grade school, Philip put up his paints to study agriculture at the University of Tennessee. At 31 years old he needed to make extra money and his wife, Shelley, suggested he revisit art. He decided to pursue teaching art to children, but in order to do that he needed to relearn how to paint himself. So he did what you do in a pre-Google world. He went to the library. “I checked out different books on artists, read up on what they did and studied their work. I became interested in Renaissance painters, specifically the muralists,” Philip offers. Alongside teaching and reacquainting himself with painting, Philip synced up with an interior designer friend and started painting murals in people’s homes and businesses. After 15 years, when ladders, scaffolding and falling buckets of paint became too much to manage, Philip grounded himself as an easel artist. “Plein air” painting, or working outdoors, is a favorite. Half of his current work is portraiture; the other half is landscapes and still life ~ all created with a goal to celebrate the beauty of life and the earth around us. “To have other people feel what you’re painting, to witness the emotional aspect of art, is very memorable,” Philip adds. 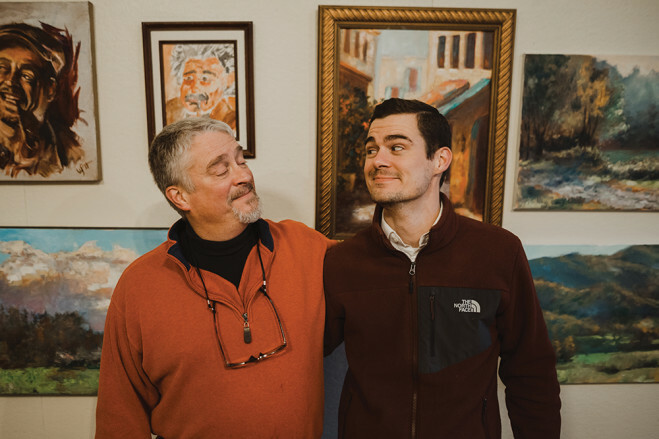 In 2017, he and Shelley relocated to Blacksburg from South Boston, Va., to be closer to their son Curt’s growing family. Curt spent three years studying architecture at Virginia Tech before switching into psychology and ultimately becoming a counselor. Like his father, art was never going to be a full-time pursuit, but hopefully something always afforded by “real life” careers. Curt primarily paints portraits, citing a chosen career in counseling with his authentic interest in people. Early on he would simply use photographs as models before moving into live subjects. More recently Curt has been exploring what it means to be human by finding a way to showcase people’s stories in his work. “I want to move into painting the experience of someone and inspire self-reflection; help the viewer confront something in themselves they haven’t seen before,” Curt offers. “Capturing personality in a snapshot painting is a fun challenge.” Even if the two have never met, the relationship between artist and subject is both symbiotic and seamless. There is back-and-forth communication that results in an inevitable connection. This yin and yang is applicative to landscape pieces as well. The artist is communicating something to the viewer and the viewer, in turn, responds with his or her own understanding. “There can be an intention by the artist, something you want the viewer to feel. But at the same time you don’t want it to be too packaged, you want to leave room for the viewer to spend time with it and interpret it,” Curt says. Both Philip and Curt hope their art inspires reflection, thoughtfulness or a new appreciation for creation. In landscapes, of course, it’s the transcendental beauty of the earth. In portraiture, it’s the value of life, of what makes each person unique. Philip’s work is available in several local Blacksburg galleries, as well as locations in Smith Mountain Lake, Roanoke, Chatham and Southport, N.C. Both artists have work on display at the Shaheen Law Firm in Blacksburg and are available for commission work. A painting can be a gateway to an emotion previously unexamined, a path to something not yet discovered. It can be a type of relationship, both with ourselves and with others; a relationship that an artist can help nurture. At the end of the day, we all have stories to tell. Perhaps a good place to start is with a box of crayons. Nancy S. Moseley is a freelance writer who didn’t have an early telltale relationship with crayons, but instead used construction paper to write stories and make books.